This trackball has been designed to improve computer access where the user may have difficulties with a conventional mouse or prefer the ease of use of this product. 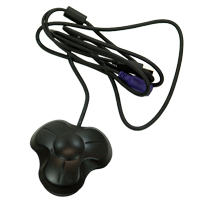 A superbly engineered trackball, the Roller II offers value for money and has proved to be very popular with users of all ages. Captive fasteners in the base allow the device to be attached to a desk or a wheelchair tray. There is a removable keyguard to provide guidance as needed for pressing the buttons. 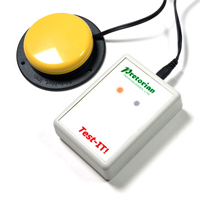 The Test-It Switch Tester from Pretorian provides a quick and easy way to test your switches before beginning work with them. This is particularly timesaving when working with multiple switches, switch interfaces, computer equipment and users. 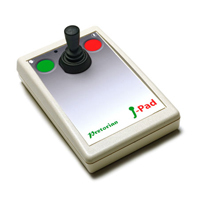 The J-Pad from Pretorian Technologies adds new capabilities to their line of products designed specifically for iPad, iPhone*, and iPod* users. The Bluetooth 2.1 connection provides a convenient wireless interface for the iOS 7 Switch Control Scanning, offering users access to all of their device functions. Apps, music, media, iBooks, photography, on-screen keyboard entry are all able to be accessed and controlled through the J-Pad's joystick and touch sensitive buttons. Two sockets also permit the connection of up to two Wired switches where the touch sensitive buttons are not suitable. The integral rechargeable battery can be recharged via any USB socket and provides approximately 30 hours of use per charge. The SimplyWorks Switch 75 is a low profile, mid-sized wireless switch that can be used with any of the SimplyWorks receivers to give switch, mouse, or keyboard functions. 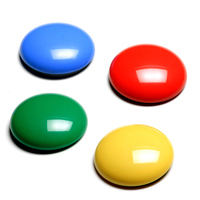 The SimplyWorks Switch 75 measures 75mm (3 inches) in diameter, is available in four bold eye catching colours and is designed so that the switch will operate across the whole area, with minimal operating force. In addition the base features industry standard fixing holes for quick and easy mounting of the device. 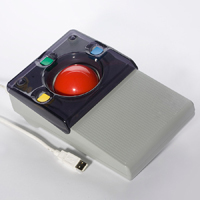 Compatible with any SimplyWorks receiver unit, the SimplyWorks Switch 75 features a 10 metre operating range and is ideal for computer switch access or for controlling toys or games. * SimplyWorks is the world's first fully integrated wireless system designed specifically for users with motor skill difficulties. Pretorian continues to expand the options available to users of Apple's iDevices with the introduction of the iSwitch. The new iSwitch uses Bluetooth 2.1 to connect wirelessly with iPads, iPhones, and iPods and enables users to have comprehensive scanning switch access for all switch-accessible Apps and Switch Control options in iOS7 and iOS8. The light-touch, low profile switch is just 75 mm in diameter and includes two ports which can support two additional wired switches. The 24 pre-programmed mouse and keyboard commands further simplify access to music, media, still and video photography. The iSwitch is powered by a rechargeable lithium battery which can be charged from any USB port. The StealthSwitch1 Single Action Programmable Foot Switch from H-Mod is an ideal and cost-effective solution for users who wish to use their foot to perform just a single keyboard or mouse-click action. The StealthSwitch1 began life as a simple privacy switch which could immediately mute sound, hide the taskbar, hide all desktop icons, and even password protect the restore function at the same time, with just a single click of the footswitch and still can perform that function. However, with the new software driver from H-Mod the StealthSwitch1 now offers users a greatly expanded range of programmable commands in addition to the original privacy functions. An easily navigated user interface enables users to effortlessly program the StealthSwitch1 to perform Single Key commands, mouse clicks (including a double-click), run programs, control media, etc. The unique "tripod" design of the footpedal means that it is easily activated from any direction. To ensure that accidental activations do not occur the pedal does offer a high enough resistance that most users will be able to leave their foot resting on the pedal without risk of activation. Note: The StealthSwitch1 is driver dependent which means that the driver software must be installed and actively running for the switch to perform the assigned actions. In order to fully benefit from the expanded capabilities of the StealthSwitch1 users should visit the manufacturer's Download Page and install the most up to date software, titled: "StealthSwitch Pro Software Version 3.09.000" for Windows, or: "StealthSwitch Pro OSX Version 1.0.1" for Mac. Users who wish to perform multiple functions or to enter multi-key commands will want to consider one of the other available Foot Switch options. This is a palm based clicking solution which eliminates finger movement from all mousing operations. Instead you use your left palm to generate clicking actions, while continuing to use your current pointing device to control the cursor. The actuation force (i.e. 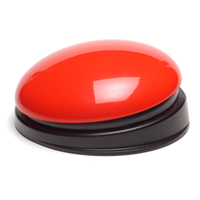 how hard you have to press to generate a click) can be adjusted from 30 grams to 300 grams, a feature that is not available on any other device on the market today. Ceci est une solution ou ce que vous fait le clic avec votre paume qui élimine le mouvement du doigt de tout opérations du souris. Au lieu, vous utilisez votre paume gauche pour générer les actions des clic, en continer d'utiliser votre souris courant a la droite pour bouger le curseur. La force d'activation (comment d'effort sa prend pour faire le clic) peut être ajuster de 30 grams jusqu'a 300 grams, une charactéristique qui n'est pas disponible sure autre dispositives sur le marché jusqu'a date. Avec l'ErgoClick, vous pouvez vraiment "faire la souris sans lever un doigt". The AirO2Bic Vertical Mouse is designed using the science of Biomechanics. The idea of the AirO2Bic is to immobilize your wrist and force you to use your upper arm muscles exclusively to move the mouse. To use this mouse properly you need a minimum of a 10" x 12" (25.4 cm x 30.5 cm) mousing area. This product is available in both left and right handed models in both pearl (white) and onyx (black). The optional Nib software provides an auto-click feature, eliminating the need to 'click' the mouse, which is quite practical for web surfing and other non-cursor dependent tasks. 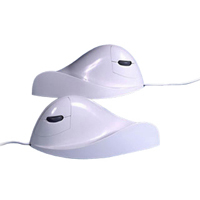 The Nib software is $55 when purchased with this mouse and this bundle is called the Virtually Hands Free Mousing System. The Nib software is also available for $80 when purchased by itself. 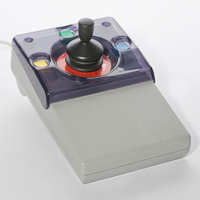 This is the deluxe version of the Joystick Roller II, and has 3 additional buttons on the unit; a Double Click button, a Speed Control (accelleration) button, and an X-Axis / Y-Axis Lockout button (to limit the movement to only the X or Y Axis if needed). This is truly the ultimate assistive joystick on the market today. This mouse alternative is ideal for users with severe motor-skill difficulties. 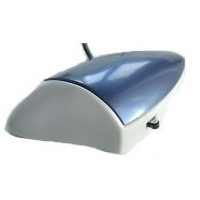 This product was designed to improve computer access where the user may have difficulties with a conventional trackball or mouse or prefer the ease of use of this product. Compared to a conventional mouse, this joystick requires very little energy to operate. Other mice or trackballs require lots of pushing to move the mouse around. The Roller Joystick just needs holding in the direction that you want the cursor to travel - and the computer does all the hard work. 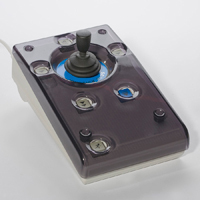 To see examples of switches which can be used with this joystick, check out our Switches category.